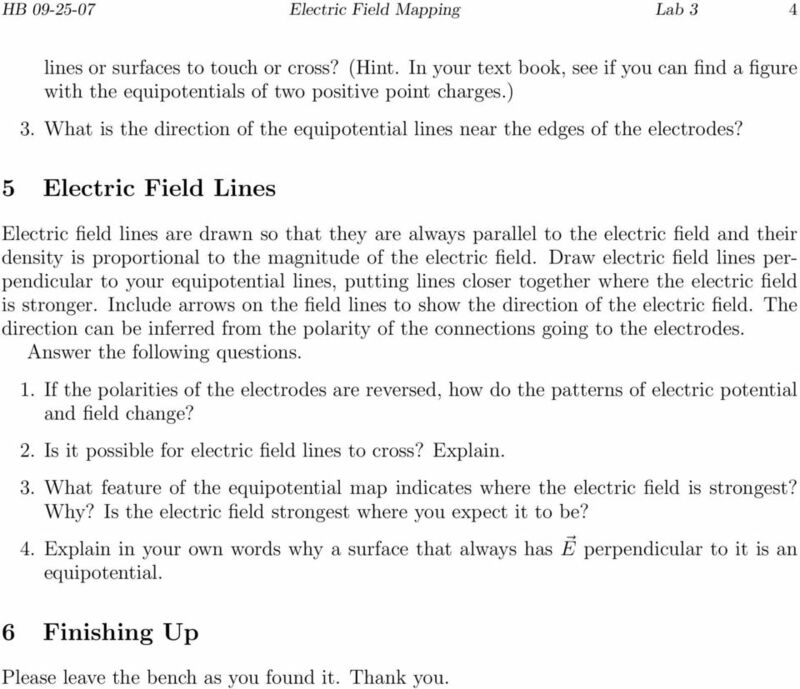 Download "Electric Field Mapping Lab 3. Precautions"
1 HB Electric Field Mapping Lab 3 1 Electric Field Mapping Lab 3 Equipment mapping board, U-probe, resistive boards, templates, dc voltmeter (431B), 4 long leads, 16 V dc for wall strip Reading Your textbook. Precautions 1. Before turning mapping board over, remove voltage leads from board. 2. Turn mapping board over by grasping two diagonal corners of board. Please do not grasp edges of mapping board, which may break a wire underneath the board near the edge. 3. Handle resistive boards carefully by edges. It is easy to scratch the resistive coating. 4. During the experiment, keep checking that the knurled nuts, particularly the one to the U-probe, are tight. 1 Description and Theory The force between charged particles is attributed to an electric field E which has the dimensions of force per unit charge. 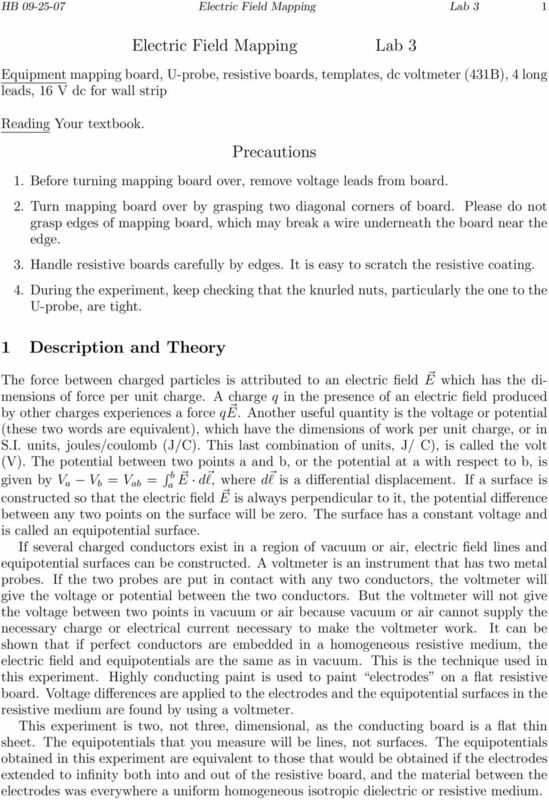 A charge q in the presence of an electric field produced by other charges experiences a force qe. Another useful quantity is the voltage or potential (these two words are equivalent), which have the dimensions of work per unit charge, or in S.I. units, joules/coulomb (J/C). This last combination of units, J/ C), is called the volt (V). The potential between two points a and b, or the potential at a with respect to b, is given by V a V b = V ab = b a E d l, where d l is a differential displacement. If a surface is constructed so that the electric field E is always perpendicular to it, the potential difference between any two points on the surface will be zero. The surface has a constant voltage and is called an equipotential surface. If several charged conductors exist in a region of vacuum or air, electric field lines and equipotential surfaces can be constructed. A voltmeter is an instrument that has two metal probes. If the two probes are put in contact with any two conductors, the voltmeter will give the voltage or potential between the two conductors. But the voltmeter will not give the voltage between two points in vacuum or air because vacuum or air cannot supply the necessary charge or electrical current necessary to make the voltmeter work. It can be shown that if perfect conductors are embedded in a homogeneous resistive medium, the electric field and equipotentials are the same as in vacuum. 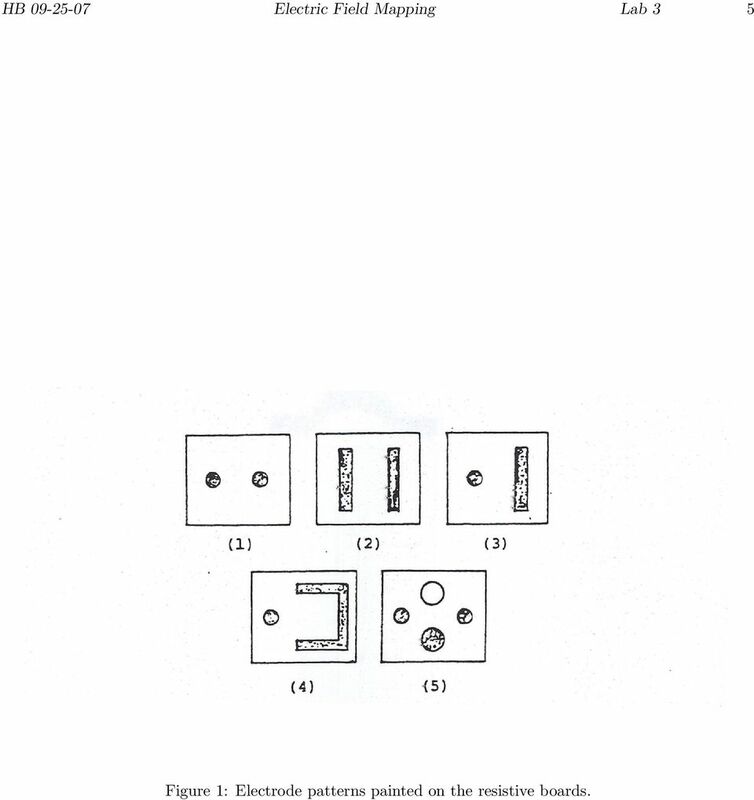 This is the technique used in this experiment. Highly conducting paint is used to paint electrodes on a flat resistive board. Voltage differences are applied to the electrodes and the equipotential surfaces in the resistive medium are found by using a voltmeter. 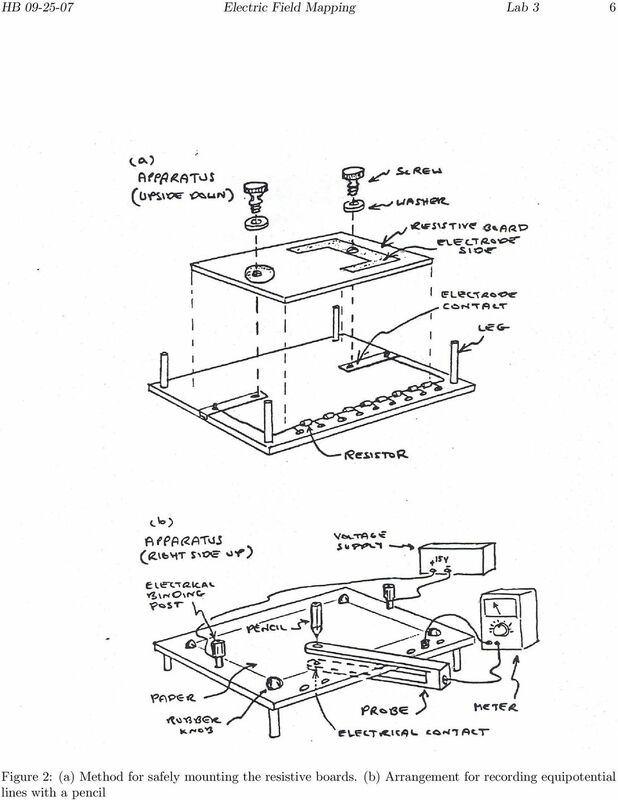 This experiment is two, not three, dimensional, as the conducting board is a flat thin sheet. The equipotentials that you measure will be lines, not surfaces. The equipotentials obtained in this experiment are equivalent to those that would be obtained if the electrodes extended to infinity both into and out of the resistive board, and the material between the electrodes was everywhere a uniform homogeneous isotropic dielectric or resistive medium. 4 HB Electric Field Mapping Lab 3 4 lines or surfaces to touch or cross? (Hint. In your text book, see if you can find a figure with the equipotentials of two positive point charges.) 3. What is the direction of the equipotential lines near the edges of the electrodes? 5 Electric Field Lines Electric field lines are drawn so that they are always parallel to the electric field and their density is proportional to the magnitude of the electric field. Draw electric field lines perpendicular to your equipotential lines, putting lines closer together where the electric field is stronger. Include arrows on the field lines to show the direction of the electric field. The direction can be inferred from the polarity of the connections going to the electrodes. Answer the following questions. 1. If the polarities of the electrodes are reversed, how do the patterns of electric potential and field change? 2. 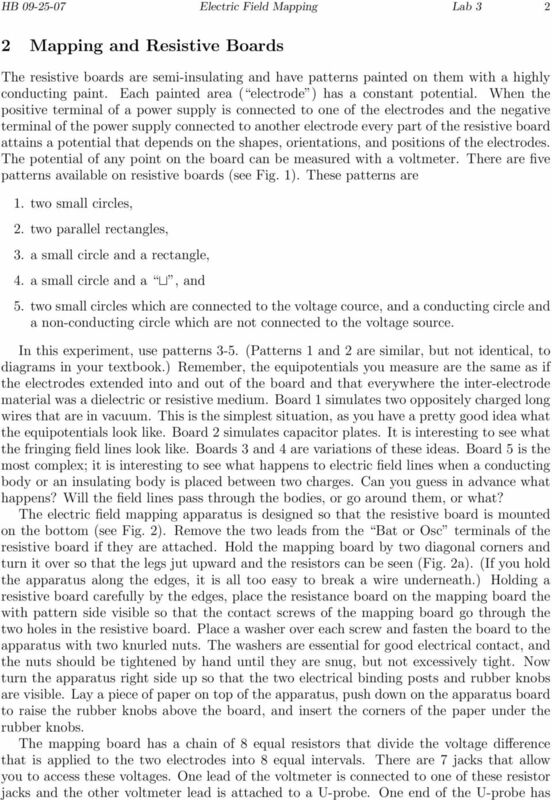 Is it possible for electric field lines to cross? Explain. 3. What feature of the equipotential map indicates where the electric field is strongest? Why? Is the electric field strongest where you expect it to be? 4. Explain in your own words why a surface that always has E perpendicular to it is an equipotential. 6 Finishing Up Please leave the bench as you found it. Thank you. 5 HB Electric Field Mapping Lab 3 5 Figure 1: Electrode patterns painted on the resistive boards. 1 Laboratory 1 ELECTROSTATICS Objective: The objective of this lab is to gain an understanding of how objects become electrically charged and how electrical charge is transferred from one object to another. 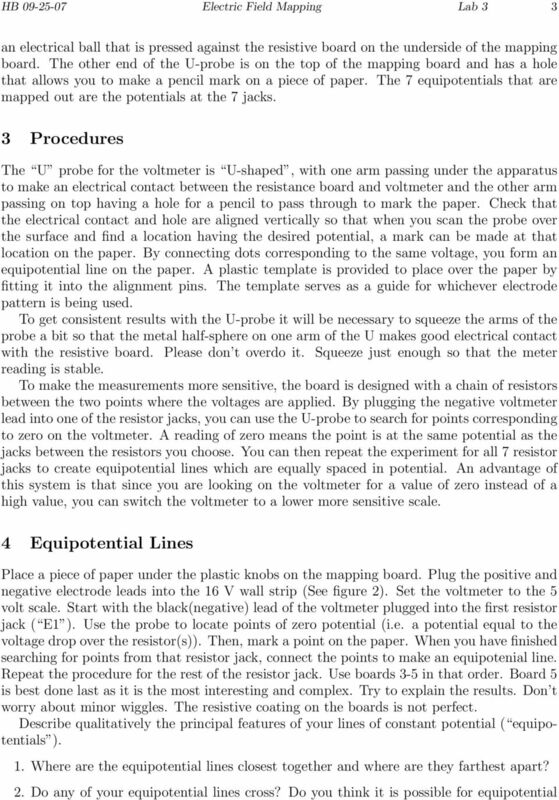 Lesson 6 Capacitors and Capacitance Lawrence B. Rees 2007. You may make a single copy of this document for personal use without written permission. 60 6- I. THEORY EXPERIMENT 6 HARGE SHARING BY APAITORS The purpose of this experiment is to test the theoretical equations governing charge sharing by capacitors and to measure the capacitance of an "unknown"
GAERTNER SCIENTIFIC CORPORATION 3650 Jarvis Ave. Skokie, Illinois 60076 U.S.A. tel: 1 847 673-5006 fax: 1 847 673-5009 email@gaertnerscientific. 2. Remove rear cover of head lamp if bulbs are covered/sealed within the housings, and remove halogen bulb carefully.